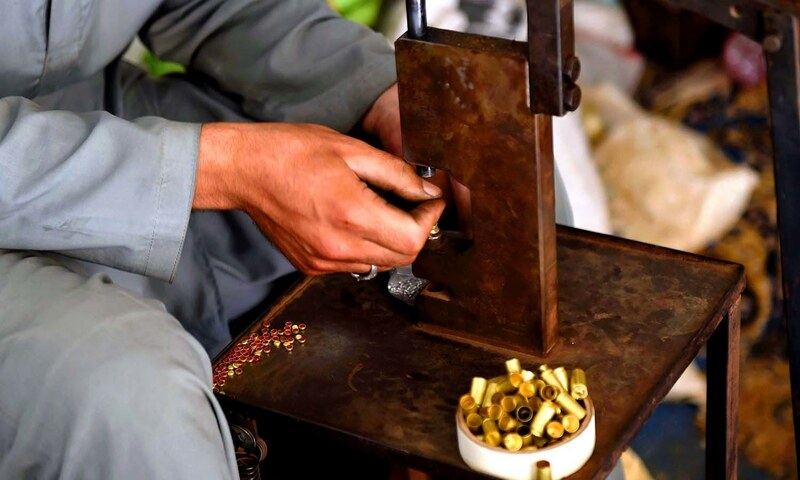 DARRA ADAMKHEL: Gunfire echoes through a dusty northwest tribal town, the soundtrack to Pakistan's biggest arms black market, where Kalashnikovs welded from scrap metal are cheaper than smartphones and sold on an industrial scale. 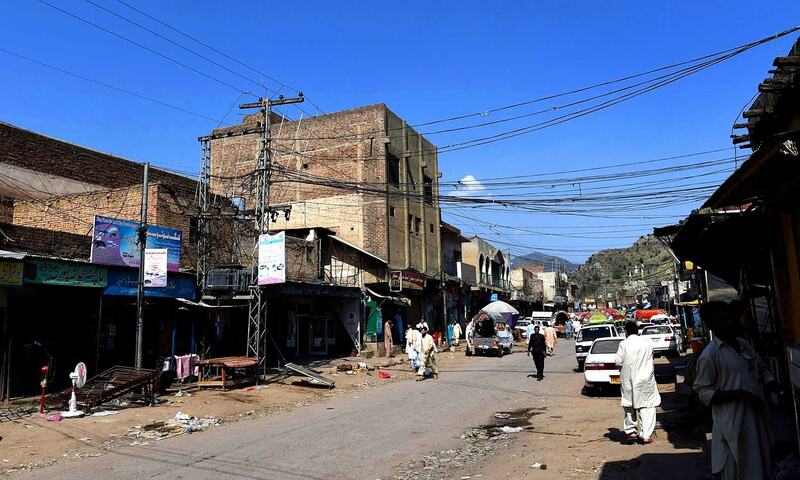 Darra Adamkhel, a town surrounded by hills some 35 kilometres south of Peshawar, was a hub of criminal activity for decades. People smugglers and drug runners were common and everything from stolen cars to fake university degrees could be procured. 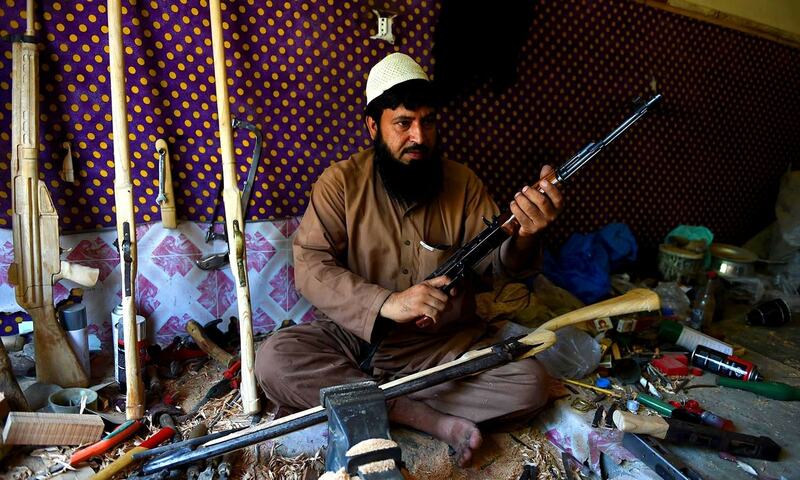 This generations-old trade in the illicit boomed in the 1980s: The mujahideen began buying weapons there for Afghanistan's battle against the Soviets, over the porous border. Later, the town became a stronghold of the Pakistani Taliban, who enforced their strict rules and parallel system of justice ─ infamously beheading Polish engineer Piotr Stanczak there in 2009. 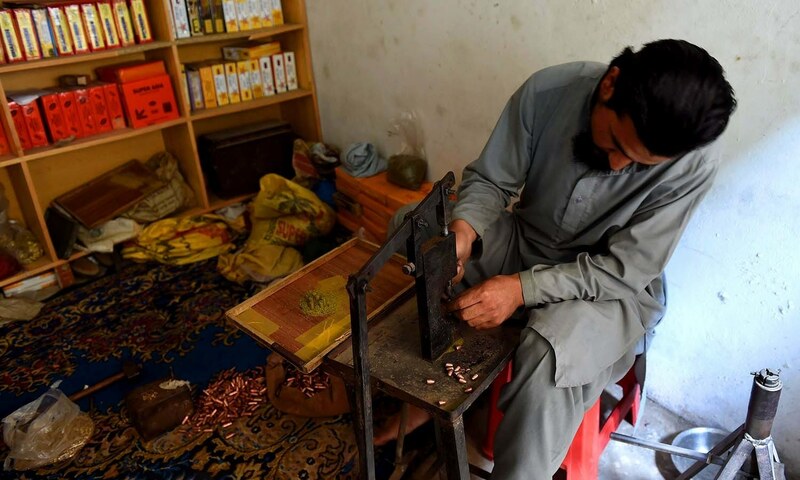 Now Darra is clean of all but the arms, yet the gunsmiths in the bazaar say the region's improved security and authorities' growing intolerance for illegal weaponry are withering an industry that sustained them for decades. 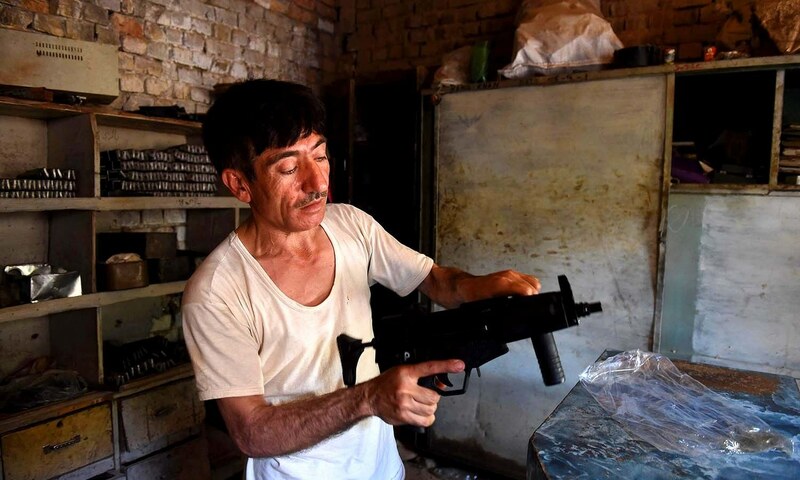 Gul is known in Darra for his replicas of Turkish and Bulgarian-made MP5 submachine guns, one of the most popular weapons in the world, widely used by organisations such as America's FBI SWAT teams. The MP5 can retail for thousands of dollars. Gul's version, which comes with a one-year guarantee, costs roughly Rs7,000, or $67 ─ and, he claims, it works perfectly. Gul then puts on a demonstration, test-firing his MP5 in the small outer yard of his workshop ─ first the single shot mode, then firing in a burst. 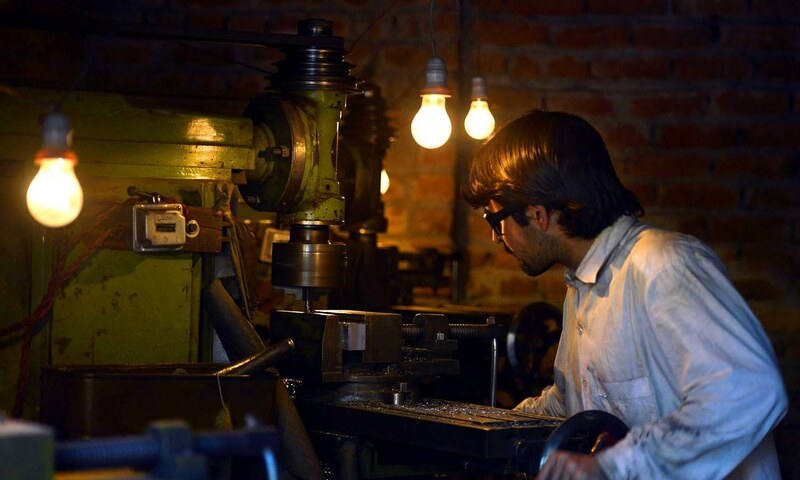 In Gul's sweltering workshop, employees shout over the roar of electrical generators as they expertly cut and drill through metal brought from the shipyards of Karachi, far to the south on the Arabian Sea. But in recent years the military has cracked down on extremism, particularly in the tribal areas, and security is the best it has been since the Pakistani Taliban were formed in 2007. 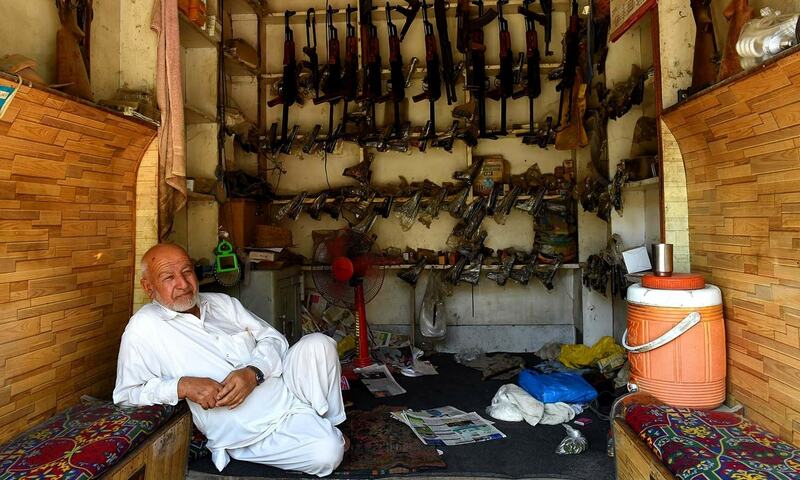 Before the crackdown Gul's workshop ─ just one of hundreds in the town ─ could produce more than 10 weapons a day, he says. 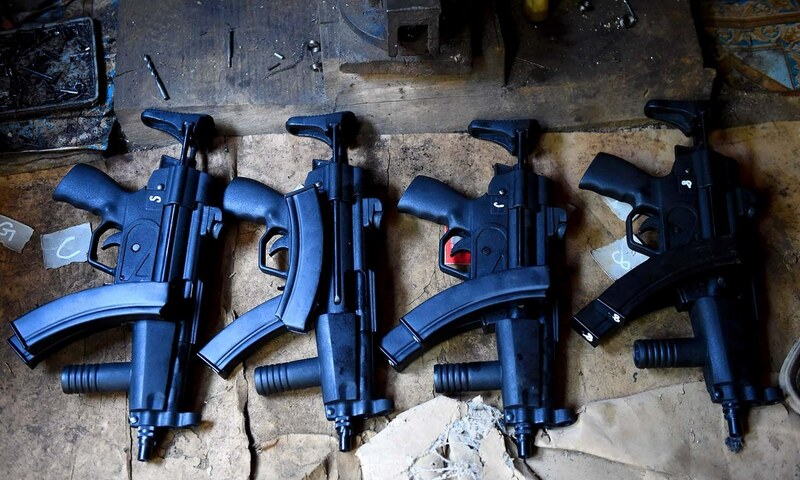 The military has not yet objected to the gun market in Darra directly, but residents say they have had to give sureties they will not harbour militants, and a half-hearted attempt at licensing is now also being made. Police and paramilitary officers were prominent at entry and exit points to the area during a recent AFP visit there. “I have been working here for 30 years but now I have no work to do,” says Muzzamil Khan, sitting idle outside his workshop. 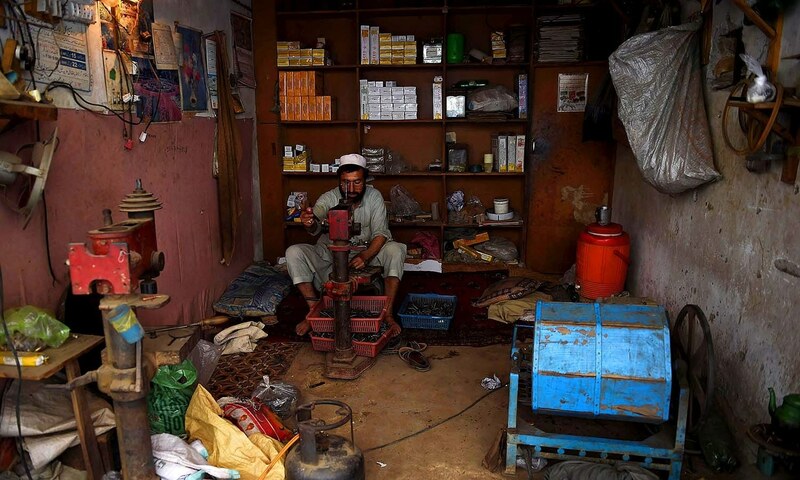 “I am ready to sell my lathe machine.” Muhammad Qaisar, making cartridges at his shop in the main bazaar, said at one point there had been up to 7,000 shops there ─ but now almost half have closed. If the government does not change its policies, he says, “I fear... Darra will be finished”. 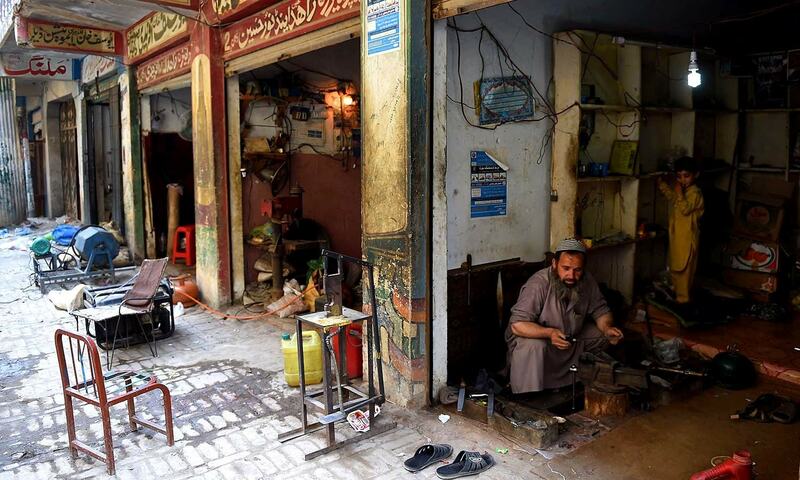 Hundreds of gun shops still cram the narrow streets around the bazaar and the sound of gunfire still pierces the air ─ albeit intermittently ─ but the gunsmiths say it is not enough. "Life has became very difficult." Woww How talented they are, instead of closing them I recommend to nationalize them these guys are so much talented and experienced. Used them in the constructive way, they can help pak military and police. Instead of shutting them down, perhaps the military could set-up an arms factory in Darra and put these skilled workmen to use making licensed arms. These highly skilled workers would be a valuable asset if their skills could be utilised in a productive commercial industry other than making illegal weapons ! These men are clearly all highly skilled tradesmen. The Pakistani government should strive to find a way to put their impressive skills to work for the benefit of the entire country. To do otherwise would be a waste. What is the legal way to buy a gun from this market? Although pretty infamous for its low quality in Pakhtunkhwa, this is still an impressive attribute of the Afridis of the Darra Adam Khel to be making guns through hands. These skilled men could learn how to make car bodies, or any commodity that involve metal, and do so to the extent of perfection. Some one need to invest in them. The Government should hire all these talented person and employee them in the same field or build a factory in the same area Darra Adamkhail.. Their talent should not be wasted. Great piece of work..the talent should be used constructively. 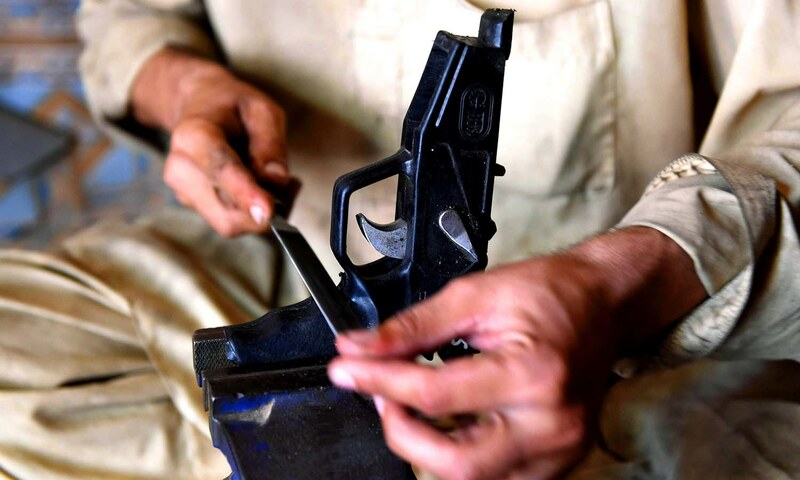 Instead of draining their skills,govt should make them organised with proper licensing procedures.Those skilled labors has potential to make a new industry in Pakistan which will strengthen economy by reducing cost of buying arms from outside & provide livelihood for poor people. Otherwise we can't cope with problems caused by these lethal weapons. So the weapons used in the target killing and mass murders are made there. Very sad that the they are still allowed to make illegal weapons. They have been producing these arms for decades and guess where these weapons end up .Karachi of course .Will the LEAs have the courage to stop the smuggling of these weapons which cross through hundreds of checkpoints till Karachi . Will there be a similar operation there as is in Karachi ? China can be requested to pump in funds to make this industry successful. Great work , great skills , great photography !!! Amzing I cannot imagine such brains are there in Pakistan beautiful pictures thanks. Instead of banning them govt should invest on them and cover their needs and buy weapons for security forces from them. It will boost economy of this area and illegal shifting of arms would also be prevented. 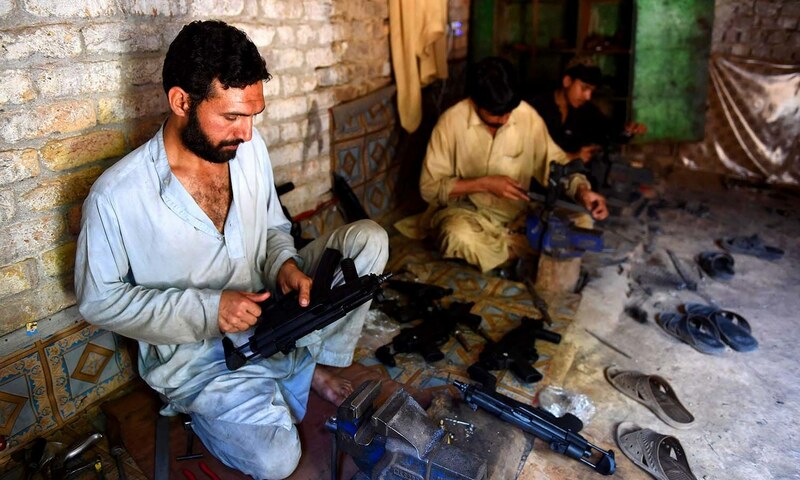 Govt should give opportunities ( govt patronized arms factories to export the products) and provide proper business to these men, licensing system should be easy to go with, also, alternate business can boost their economy. The firearms industry there is old. Regulate it don't ban it. There is a lot of talent and in fact there are many foreign buyers of these firearms. Legalizing purchase of weapons from Dara can enhance the business, improve security as no robber would dare stop anyone and it will make Pakistan strong. No country will dare attack Pakistan. 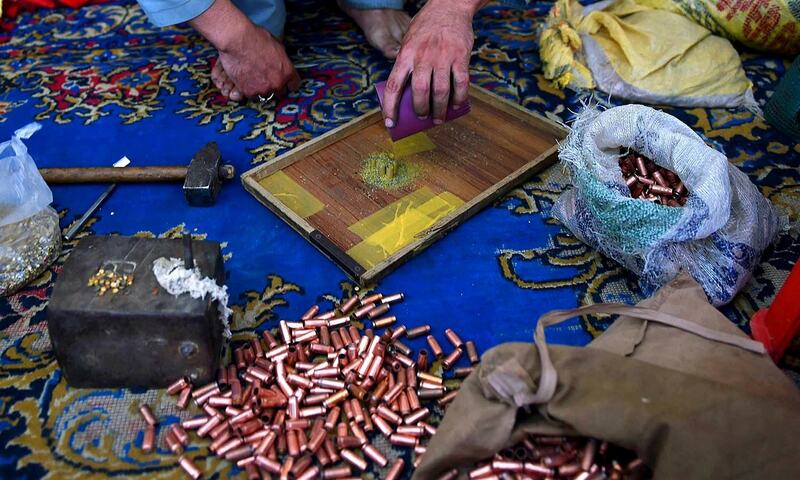 scary, imagining the fact that, each of the bullet can take a life. even more scary are the comments of readers encouraging it. guns are made of special type of corrosion resistant steel which is not available in local markets. the gun casts need special heat treatment for barrels. the locals of darra adamkhel must be buying the casts legally or illegally and machining, drilling, shaping and painting them as finished goods. same goes for shells of bullet. whoever is selling the casts, knows the burden of this finished product thats why he stopped at making the cast of guns and sold to pakistanis who bear the burden of these killing toys. it is most probable that the weapons that killed innocent students in "2014 Peshawar school massacre" came from a place like this. now tell me how many of you support this! Pakistan never saw talent when it came to it. Talent in Pakistan is and always will be recognized by foreigners. Darra Adam Khel craftsmen should be seen and given that opportunity and accepted in the fold of talented people. They should be provided the opportunity to work openly and their skills should be used to its fullest potential. If a military ordnance factory is established there, the traditional talent would be saved as well as employment. The presence of military forces would also keep a check on militants from brewing in the town. @D thank you for your sane comment! It's quite scary to see so many comments supporting this. 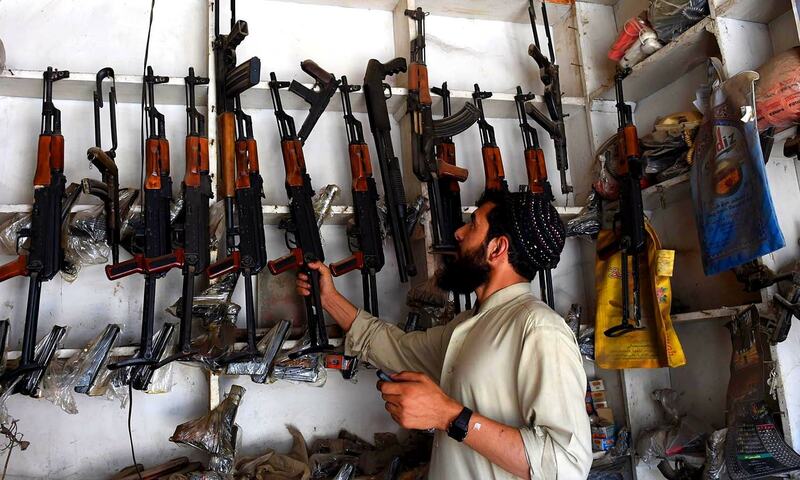 The guns manufactured in Darra Adam Khel are the cheapest in the world. The Government should encourage these manufacturers and make efforts to export it to other countries. These people will stay away from the menace of terrorism if they can earn two times bread.